The geese in Stewart Park, Ithaca NY, are getting ready to head south. lol, You'll have to turn your monitor around. Don't you just love spotting those formations? I like it when they change the "head bird." Very interesting! I spend too much time indoors and miss them. A great sight. You caught them well - ours left three months ago! It is the moment when the Nature is elegant. Nature is a great painter. I am glad that you watched nature of the Far East. I love to look up when I hear that familiar honking, but never had a camera with me. Nice shot. 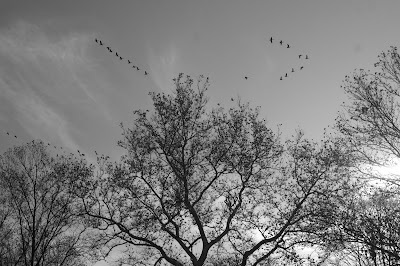 The majority of the Canadian Geese left Toronto at the end of August. They must have made a stopover. quite wonderful. great size realtions from earth to trees to birds. is this one in print? Neat shot...perfect for fall heading into the winter months. Don't you love watching the foramtions they make when flying south? They change the "lead' so often! It has been too rainy for me to be out walking to see them lately. Thanks or stopping by -- I have been sick and unable to blog and visit people but am trying to get around to at least those who stopped by and commented on my blogs that I had already scheduled. I am doing much better ater straining my back about two weeks ago. Hope to get back in the swing o things asap. I see I already managed to get something of on this comment section before. . .
You asked about how often I find people on benches I want to photograph. . .sometimes it is quite frustrating because I know I will not be that way again so I try to take a photo from the back and a few times I have asked people if I could take a photo before they sit down. BUT, most of the time, I find empty benches.